In a word, no. 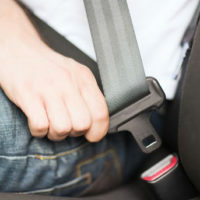 Maryland is one of about 30 states that reject the so-called seatbelt defense. If you are injured in a motor vehicle crash caused by someone else, you should be allowed to recover monetary compensation without regard to whether you had your seatbelt on at the time. Here’s how insurance companies sometimes try to misuse the law to cheat innocent victims. If you’re injured in a car wreck, call The Law Offices of Todd K. Mohink, P.A. as soon as possible, so we can help protect your rights. Maryland has one of the most rigid and harsh contributory negligence laws in the country, yet it also is relatively fair in other ways. Every state has a rule for apportioning fault. In some states, a person who is partially to blame for an accident can still recover some compensation. In other states, this is limited to situations where the injured party is less than half at-fault. However, in Maryland, any amount of liability on your part will act as a complete bar to compensation. If you are hurt in a car accident, this can be used as an enormous sword for an insurance company to deny compensation by arguing you were slightly to blame. Insurance companies frequently concoct strange and almost nonsensical reasons to deny claims. The so-called seatbelt defense is just one of them. Here’s how insurance companies use this defense. Say you are in a crash and claim that you hit your head on the steering wheel. The insurance adjuster may then respond by claiming you must not have been properly restrained, thus your injuries are partly your own fault for not wearing a seatbelt. They may also claim that by breaking the law (seatbelts are a legal requirement), you are partly responsible. At first, this may make sense. And a lot of people just let the insurance companies get away with it, leaving the matter there. However, Maryland is one of the majority of states that see this defense for what it is, a red herring. Maryland disregards this defense and will not allow a defendant to introduce this evidence at trial in order to argue contributory negligence, because it has nothing to do with fault. The concept of contributory negligence refers to situations where you, the injured party, share in the blame for causing the accident. Since a seatbelt has nothing to do with that, it should not be used to bar recovery. Still, there are situations where the information could potentially be admitted at trial. For instance, if the injuries can only be explained by discussing how you were ejected from the vehicle or tossed about inside the vehicle, there’s a good chance that the jury could hear about it anyway. It just cannot be formally used to reduce compensation the way that insurance adjusters may try to claim. If you need help after a Maryland car accident, give us a call. The Law Offices of Todd K. Mohink, P.A. can help you fight for the financial compensation that you deserve. Consultations are free, so call today.